DUG Insight User ManualDUG Insight LearningLearning Quick TipsHow do I list what’s in my session? The Product Extents Table is often used to find data with the wrong coordinates or data that’s loaded incorrectly, but you can also use it to get a quick inventory of your session. In Control Panel, open the View menu and choose Products Extents Table. Surveys, volumes, wells, horizons and more are all listed in here. Click on column headers for quick sorting, or just scan through the list. 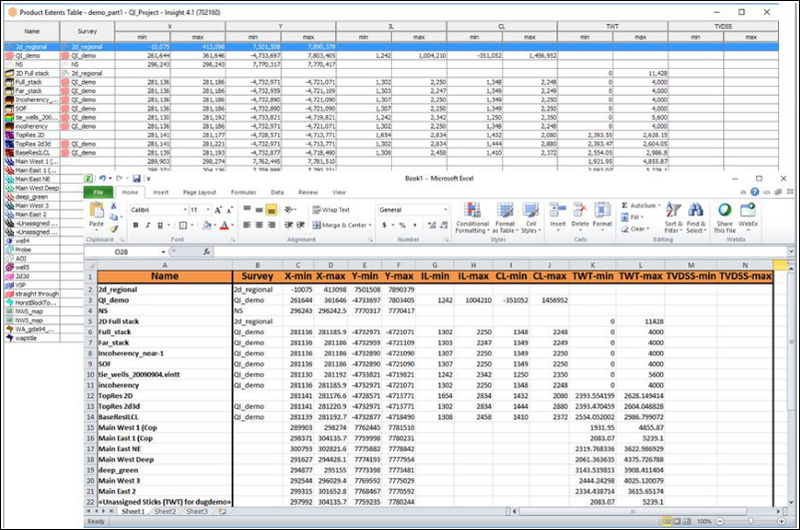 Right-click on the table and Copy the data for pasting into Excel or another spreadsheet. When you find that one thing that you’re looking for, try right-clicking it then choose Open in Control Panel to quickly jump to the item.